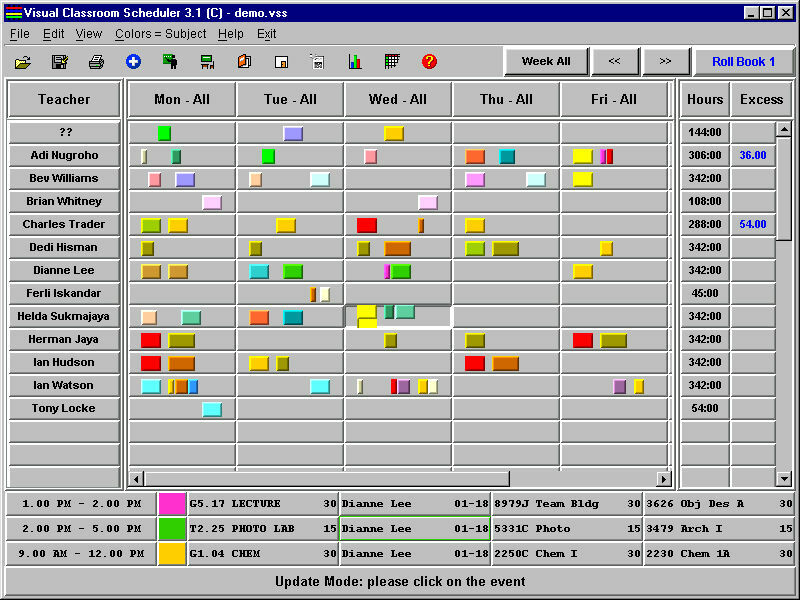 The Visual Classroom Scheduler uses colorful graphics to make timetabling easier. 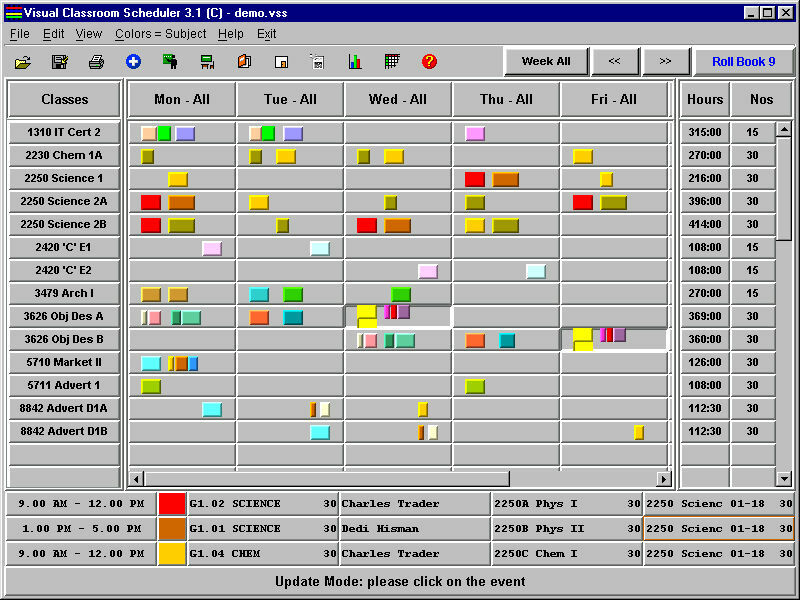 Classroom events and activities are shown as colored rectangles over a weekly grid. 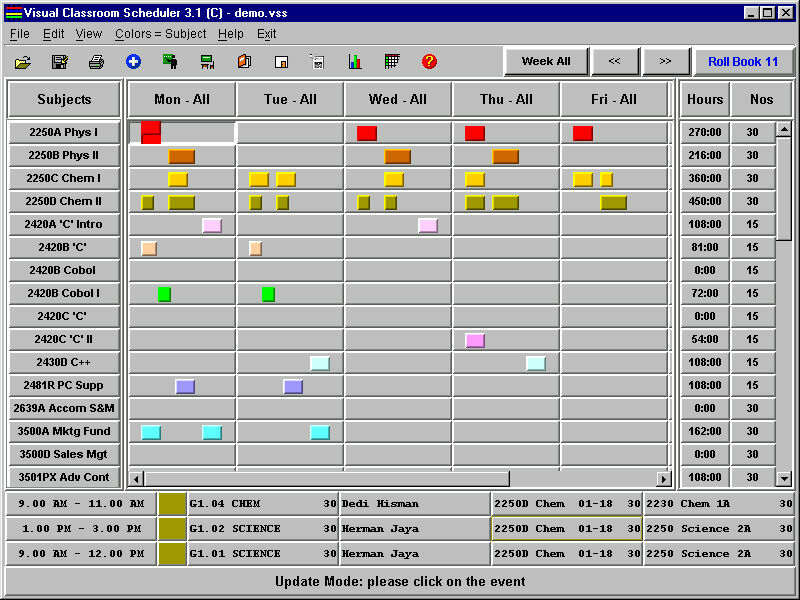 The grid can show activities for "All Weeks" together or those on any particular week. No setup time is needed - start entering classes immediately and add more details later. Don't worry about suitable times or allocations - move classes about with the mouse - later. VCS is designed to produce a simpler, faster and better result than any other system. The screen capture above shows one of the four integrated VCS views which make VCS a winner. VCS views simplify management of class groups, room allocations and teacher preferences. To swap classes between rooms, click, drag and drop from one row to another - on screen! To review subject allocations to Rooms or Teachers - (Use Subject view). Details changed in this way, will instantly update details for all other views. Simply work on one view at a time - swap classes between rooms or teaching staff visually! Fine tuning the schedule to suit staff, students and Campus Management is a snap! Bring classes back into the faculty area. Align staff and students to "home" rooms. Look at the blank spaces in the schedule, can you see spots for new classes or improvements? The G2.16 Pentium 750 is available Mondays and Tuesdays! Fill it up with a click, drag and drop! See the top row - the room named ??. These classes need to be allocated to a real room. Use the mouse to click and drag the class to the best available room.....easy. Swap classes between staff to suit preferences and capability. Swap classes between rooms to suit room suitability, capacity and save travel time. Swap subjects between classes to give students a day off! Sounds incredible? VCS 'click drag and drop' makes it easy! Merge departmental schedules to form a Campus VCS. See opportunities for classes in other Campus areas. VCS guarantees 10-20% more! Share the best facilities and equipment. Recycle under used facilities. Save waste and spend it on useful stuff! Everyone loves this! In each view, names are shown down the left hand side. Days of the week are shown across the top. 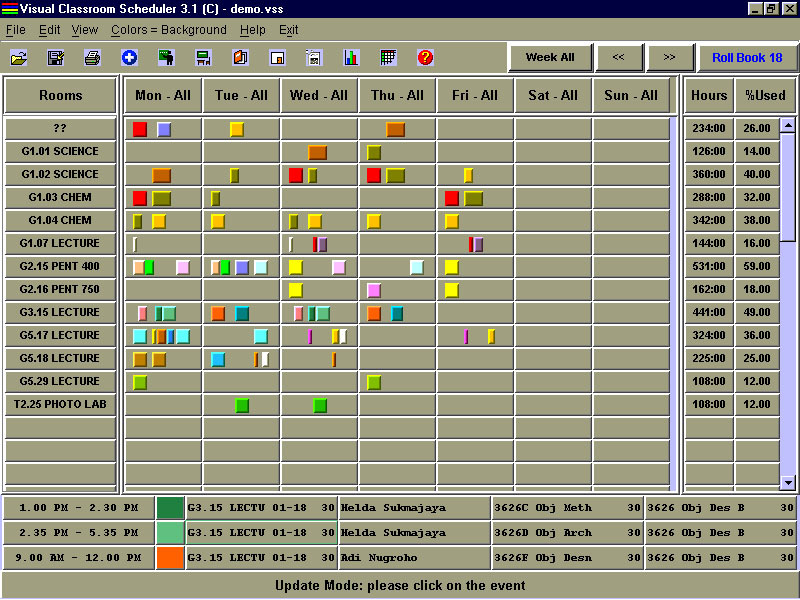 Scheduled classes are shown as colored rectangles - longer ones indicating longer classes. Hours are totalled on the right. Down below, a zoom area shows details of Class times, Room names, Staff, Subject details etc - just position the mouse cursor over the rectangle. Classes are easily dragged to other rows or days to change the allocation. Hour totals show teaching hours planned for all weeks for every teacher. Lots of color options are used to speed subject allocation and highlight schedule improvements. Timetables, listings, costed summaries and statistics are available to help manage the budget. Settings are available for weekly teaching hours, and "Teacher" "Lecturer" or "Instructor" names. Spreadsheets and databases can be imported and exported. Eliminate unnecessary clashes and ensure classes will work before semester begins. FastEntry features reduce data input time for the whole job to just a few hours.